Barely two weeks after a student group, Speak Out Act Right (SOAR) concluded its rally to end extremist practices in Samaru, a community hosting the famous Ahmadu Bello University, the group, with support from Edventure Partners (EVP) , has again dared students and staff members to shun extreme practices in the university. 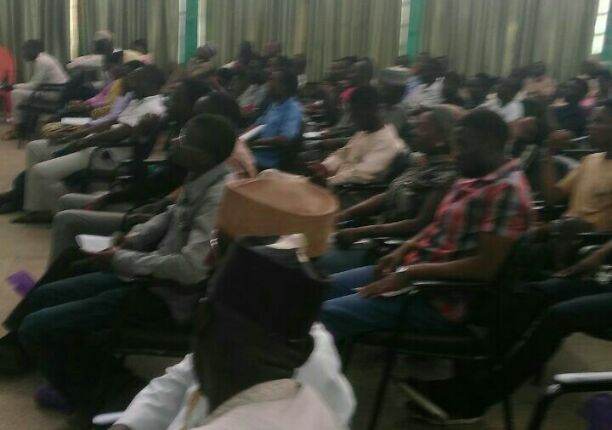 In a seminar organised to mark the end of the #P2PChallengingExtremism campaign in the university, the coordinator of the students’ campaign, Mr Elisha Timothy noted that, the campaign has created awareness both within the university and its host community saying that, “it is imperative to counter forms of extremist practices which bring about a climate of fear in the university community. Speaking at the seminar, the representative of the Dean of Students’ Affairs, Prof. Bashir Jumare thanked Edventure Partners for supporting SOAR to carry out the campaign which has benefitted the University’s faculty and students tremendously. However, he noted that the University has a zero tolerance for extremist practices saying that “the University places high value on human dignity, respect and transparency. “So far, this campaign for the last one month and two weeks has dragged our attention to existing cyber-extremist practices and gender extremist indulgence and ABU as a responsible University will respond with policy to address all of these issues” he said. In the same vein, the Director of Gender Policy Unit, Ahmadu Bello University, Dr Binta Abdulkarim noted that religion or gender is not a justification for reducing human dignity saying “We do not deal on religion; we deal on individuals and stand for human dignity. “What joins us together is greater than what divides us. Hence, religion is not enough, or, a justification to reduce or objectify our humanity. What this campaign has done for the university is to create awareness on the existing forms of extremism on campus; it has provided alternative narrative to extremism and has nudged female sstudents to take action on equal gender representation”, she said. On his part, Dr Muhammad Kabir Isah lamented the rise of extremist ideologies in Nigerian campuses noting that politicians now use religion as a tool for mobilising students for selfish political points. “This is a problem that we must address as a nation because religion and politics is destroying our humanity. One of the ways we can come out of this is to support initiative like this. “With the level of students participation through out this campaign and signatories gathered from the faculty and students, I can see the paradigm shifting. Campaign of this nature should be replicated in other Nigerian universities. Our survival as people depends on this”, he concluded.